Scammers often use familiar company names or pretend to be someone you know. Here’s a real-world example featuring Netflix. Police in Ohio shared a screenshot of a phishing email designed to steal personal information. 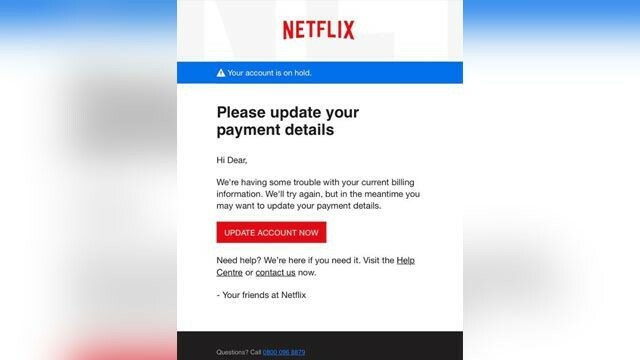 The email claims the user’s account is on hold because Netflix is “having some trouble with your current billing information” and invites the user to click on a link to update their payment method. Check it out. If you have concerns about the email, contact the company directly. But look up their phone number or website yourself. That way, you’ll know you’re getting the real company and not about to call a scammer or follow a link that will download malware. Take a closer look. While some phishing emails look completely legit, bad grammar and spelling can tip you off to phishing. Other clues: Your name is missing, or you don’t even have an account with the company. In the Netflix example, the scammer used the British spelling of “Center” (Centre) and used the greeting, “Hi Dear.” Listing only an international phone number for a U.S.-based company is also suspicious. Report phishing emails. Forward them to spam@uce.gov (an address used by the FTC) and to reportphishing@apwg.org (an address used by the Anti-Phishing Working Group, which includes ISPs, security vendors, ﬁnancial institutions, and law enforcement agencies). You can also report phishing to the FTC at ftc.gov/complaint. Also, let the company or person that was impersonated know about the phishing scheme. For Netflix, forward the message to phishing@netflix.com.